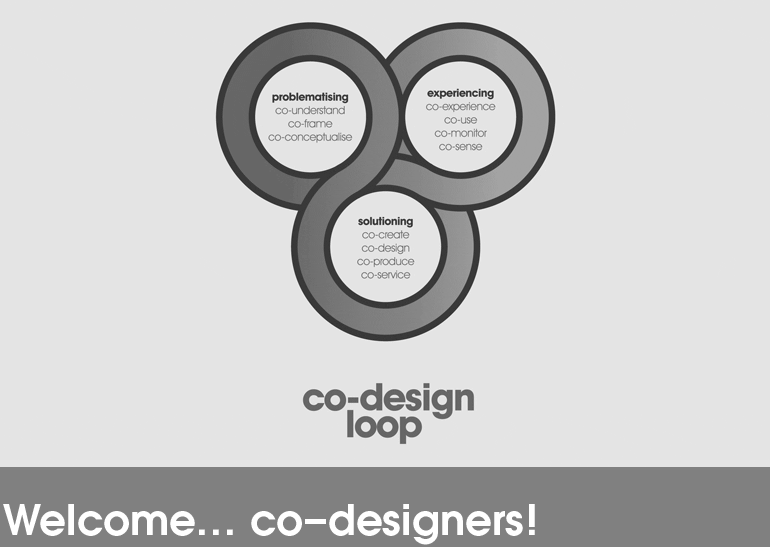 In March 2009, I promoted the application of co-design, designing together, as a fundamentally new way of practising design that I saw, and still see, as essential to our transition to more sustainable ways of consuming, producing, living, working and playing. I created ‘the co-design loop’, where diverse actors and stakeholders enter the first loop, ‘Experiencing’, to share their understanding of a specific real world context. Having collectively defined their context the co-designers move to the second loop, ‘Problematising’, where they share their understanding of the problems of this context in order to determine the ‘meta-problem(s)’ i.e. those that are systemically operating within, and having a controlling or significant affect on, the context. At this point the co-designers are ready to create a ‘design brief’ and move into the third loop, ‘Solutioning’, where they design the solutions together to meet the requirements of the brief. As the ‘solution’ is birthed into real life it becomes part of the ‘Experiencing’ loop and the whole co-designing process can start again. I use specific tools in each loop to help workshop participants share their ‘collective intelligence’. Recently I’ve been reflecting on how to develop my co-design loop and felt it was necessary to expand my approach with a fourth loop, exploring ‘Possibilities’. This follows on from my previous post on Eudaimonic Possibilitarian Design(-ing) where I suggested that we need to look harder at the possibilities that a context offers. What sort of assets and resources (human, non-human, biotic, abiotic) exist within a specific context? How can these be a starting point for new creative processes? Does designCAPITALIA offer a way of ‘auditing’ the assets and resources of a context? And, how might collective understanding of these assets and resources positively inform the co-designing of the ‘design brief’? 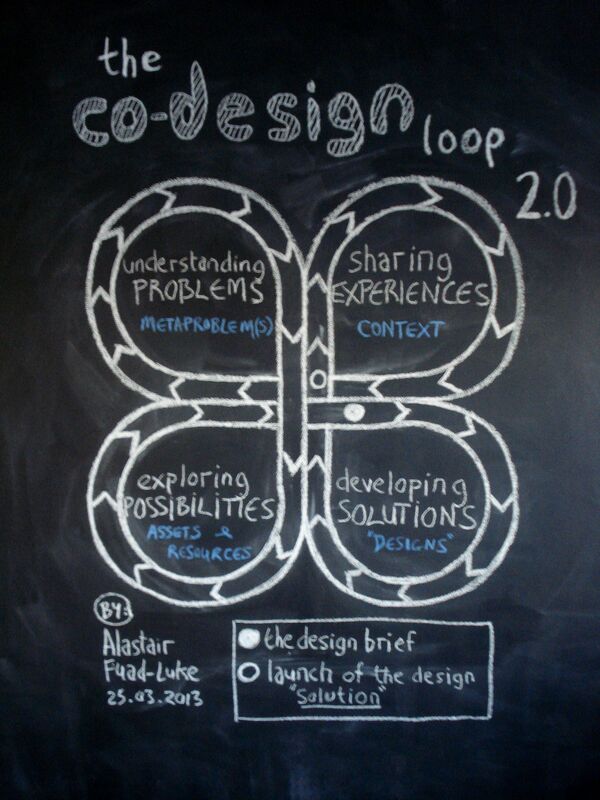 So, today I launch, ‘the co-design loop 2.0’, which I believe encourages professionals and citizens into an holistic process to collectivise decision making upstream of the design brief (sharing Experiences, understanding Problems, exploring Possibilities) AND, more traditionally, encourages (co-)designing together downstream of the brief (developing Solutions). The first three loops are essentially a way of ensuring a robust interrogation of the collective ‘design brief’ by embedding multi-actor/multi-stakeholder voices, perspectives, beliefs and knowledge (this is the ‘collective intelligence’). Over the next few months I shall be releasing a full version of the co-design loop 2.0 as an Open Source approach, showing the tools I use in each individual loop to facilitate and enable the co-designers.